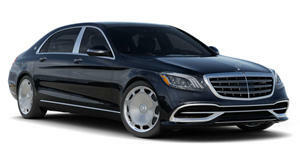 It's like the Maybach S-Class. But a meter longer. You’re looking at the ultimate S-Class. Unveiled ahead of its world debut at Geneva, the new Mercedes-Maybach Pullman is the pinnacle of the Mercedes lineup. Coinciding with the 50th birthday of the Mercedes-Benz 600, the new Pullman is the second Mercedes-Maybach model, and at 6.50 meters long, is over a meter longer than the Maybach S-Class. After spending at least 500,000 Euros on the unarmored model, buyers will never sit behind the wheel of the chauffeur-driven limousine. Instead, they will be ensconced in the rear “club lounge” sat in executive seats across from two backward-facing fold-down seats in a vis-à-vis arrangement, and behind an electronically-operated partition window that can be turned opaque with the flick of a button. With a 4,418-mm wheelbase and 100-mm more headroom than an S-Class, there is massive rear legroom, easy entry and exit, and a unique level of comfort. The seats recline by up to 43.5 degrees, offer calf support, head restraints with extra cushions, and come coated in high-end leather. Look up and there’s three analog instruments in the headliner displaying temperature, speed and time. Rear window curtains offer privacy for when viewing the 18.5-inch electrically-extended monitor, and a Burmester 3D surround-sound system provides some serious aural pleasure. Power comes from a 6.0-liter twin-turbo V12 rated at 530 hp and 612 lb-ft of torque. Mercedes didn’t bother releasing performance specs, because buyers won’t care. Check back for live images from Geneva in a couple of weeks' time.